He's arrogant, domineering, and... To. Die. For. Serena Cross didn’t believe her best friend when she claimed to have seen the son of a powerful senator turn into something...unnatural. Who would? But then she witnesses her friend’s murder at the hands of what can only be an alien, thrusting her into a world that will kill to protect their secret. Hunter stirs Serena’s temper and her lust despite their differences. Soon he’s doing the unthinkable breaking the rules he’s lived by, going against the government to keep Serena safe. But are the aliens and the government the biggest threats to Serena’s life...or is it Hunter? Wow, Wow, Wow! So I love Daemon, Katy and the Luxen clan and arum are bad! At least... that's what I though! My heart is split in two! Reading Obsession was such an eye opener and I absolutely loved it. 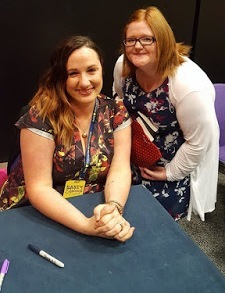 Jennifer L. Armentrout is an amazing author and I will be forever dazed at how she can capture my attention from the very first pages of her novels! Hunter and Serena are two of my favourite characters to have read about and I want to much to read more about them! This book proves to any readers how utterly fantastic this author is! You need to read this book and all the Lux books! I cannot wait to see what happens in Opposition! I need that book NOW! Are you are a fan of JLA? What's your favourite book by her?